So throughout this blog I hope to compare and contrast Mass Communication systems within Europe to what we have learned in America and while at Pierce. I’m already learning this will be difficult with culture barriers, one being not knowing the language but as I come close to my first week in Athens I have a lot to share. 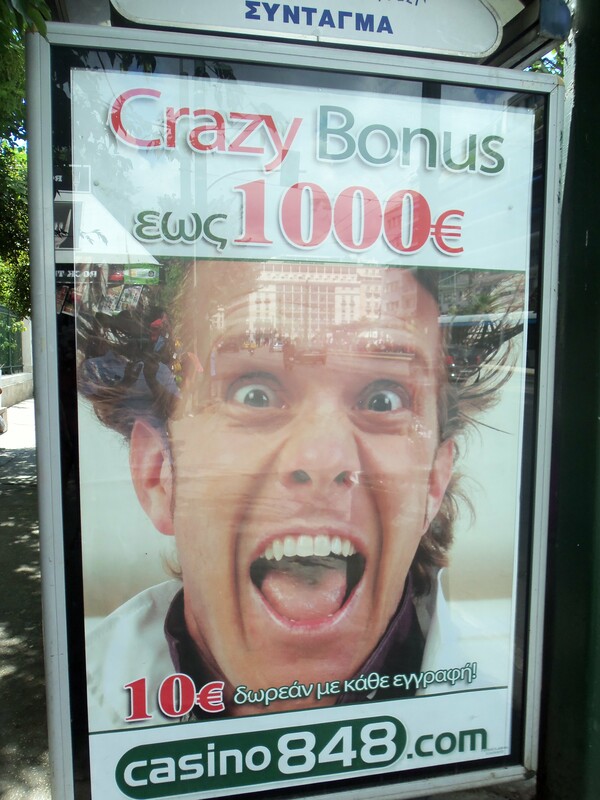 First, as we left the airport and made our 30 minute ride into inner Athens I noticed something: billboards – and lots of them. This is normal for such a highly trafficked area but the only thing is it was the same billboard advertisement the whole way to our apartment for Casino 848 (picture above). I counted the amount of time I saw the billboard from the time we left the airport to the time we got to the apartment and I saw 67 in a short 20 minute drive. I was amazed at the push for this casino and felt that there has to be a reason for such an overload. I wondered if this was purely a communication and marketing strategy or if this was more of a governmental/economical reasoning behind the overload of billboards. There’s no clear answer but I feel that it has to be leaning towards the economical aspect to grab attention of tourists looking to spend money. Also, aside from the billboards within the first few days we have done much exploring and walking and have gone to several pubs and bars as we are of legal age in Athens. In doing this I have made one major observation, there are really no TV’s in the pubs over here. When thinking of a bar back home, you would think loud music, lots and lots of high tech flat screen televisions, everywhere (sometimes even in the bathrooms) playing sports games, but not here. I have seen a TV in a bar or two but they’re not high tech, and are often small in size, not 50 inch plasma screens. And the music is often more mellow and quiet in comparison to home. I feel like this is a bit different for us. Normally when going to a bar we are consumed by these two mediums and spend much of our bar time talking about the game on the TV, if there’s any talking involved at all. But here it seems like when out, people are more into conversing with one another and life itself rather than talking about media. Also, personally, within my own realm of Mass Communications, something I noted was that none of us here have really even put on a television. Normally, this is a bit odd when thinking of college students as a TV is always on, even if it’s in the background for amusement while multitasking but not in the short week that we’ve been here. I think us personally are more intrigued by the way of life here in Athens as opposed to life in a media world. Though, I will admit I have checked my Twitter for updates on the Bruins and Red Sox. For now those are a few main observations I have made. I will be discovering more as we get adjusted in the coming days. Stay tuned for more. Editors Note: Be Sure to check out “Pierce Abroad” by various Athens Scholars to read about what has gone on during the 2010 Athens International Studies Trip.